This oil is very easily absorbed and supports circulation of the blood and skin health. Especially recommended for the over 40's. 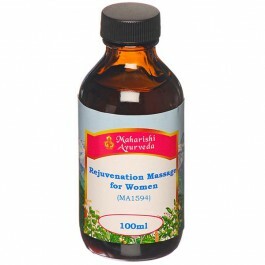 Enhance the benefits of your Ayurvedic daily massage with our specially blended Rejuvenation Massage Oils. More easily absorbed by the skin than most regular massage oils, these precise blends of Ayurvedic herbs and aromas deliver results more quickly - good circulation, especially to nerve endings; balance of mind and emotions and natural resistance to stress; greater stamina through the day and deeper, better quality sleep. Our light, fragrant Aroma Massage Oils offer the benefits of the daily self-massage and the healing scents of therapeutic aroma blends at the same time. The perfect choice for the days you're feeling the effects of day-to-day stress, these blends are formulated by skin type and are designed to nourish and balance the emotions. They help relax frayed nerves and keep the mind alert, focused and calm. Regular oil massage is seen by Ayurveda as one of the pillars that help maintain good health. Ayurveda sees our skin as a major body organ. Although it acts as a barrier and a protective layer for our internal organs, it is also porous and we absorb many things though the skin, including toxins. Oil massage not only soothes the whole nervous system, it nourishes the body and strengthens blood circulation. It also aids in the elimination of environmental toxins and also metabolic waste that our body creates during the digestive process. With regular massage, the skin becomes silky soft, smooth, radiant and it maintains a youthful elasticity. Enrich your skin with these exquisite massage oils. Especially prepared for the maturing skin (over 40). Precious ingredients make these oils an extraordinary product. For relaxation and deeper sleep. 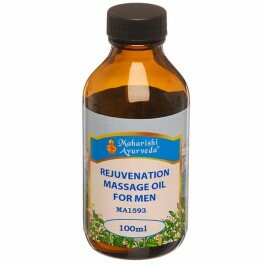 Enhance the benefits of your Ayurvedic daily massage with our specially blended Rejuvenation Massage Oils. More easily absorbed by the skin than most regular massage oils, these precise blends of Ayurvedic herbs and aromas deliver results more quickly - good circulation, especially to nerve endings; balance of mind and emotions and natural resistance to stress; greater stamina through the day and deeper, better quality sleep. Warm the oil and apply it to your lower arms, hands, lower legs and feet before bed to improve the quality of your sleep. Pay special attention to the base of the nails of hands and feet. Also use it for your daily body massage; dilute it 50-50 with a base oil such as sesame or almond oil. Leave it on for 15 minutes before taking a warm bath. Generally well tolerated but first test for skin sensitivity by applying a little oil. External use only.